In Search of the Camp Roberts 1 MW (MegaWatt) Solar Project. On-site tour with BELECTRIC Inc. Anyone reading The Nanosolar Efficiency and Cost Roadmap post might have predicted my intention to survey the 1 MWp (MegaWatt-peak) solar project planned for the California Army National Guard’s Camp Roberts in San Miguel, California. With rare patience, I waited through the variable though mild winter until early March when I imagined the project might be nearing completion and fearing an imminent announcement. From the map included in the Nanosolar: Low Cost Solar Power on DoD Installations presentation at the US Department of Defense DoD Environmental Technology Technical Symposium, November 30, 2011, I knew the project was located just east of U.S. Route 101 near the Camp Roberts main gate. I later heard the base military police are both vigilant and swift to respond to the entry of anyone on the grounds. At least there were no signs forbidding photography from outside the project fences. Without the key module information, I did not have much to post about the project besides the photos. Leveraging an introductory meeting at Solar Power International 2011, I contacted BELECTRIC USA to see what else I could find out. BELECTRIC was kind enough to offer me a site tour which was deferred by mutual agreement until the solar project was near completion. About six weeks later in April, I got to tour the Camp Roberts solar project with BELECTRIC. It was very strange for me to be inside the fence for a change. All the Nanosolar Utility Panels had been installed on the ground mount racking structures utilizing the signature BELECTRIC wooden crossbeams. The inverter pad was wired and ready for the installation of the central inverter being delivered the following week. BELECTRIC would have completed the project sooner but instead used the installation to train more BELECTRIC associates. The Camp Roberts solar project does use the 200 Watt CIGS (Copper Indium Gallium diSelenide) Nanosolar Utility Panels with a module efficiency of 9.99% and wide +/- 10% rated power tolerance. 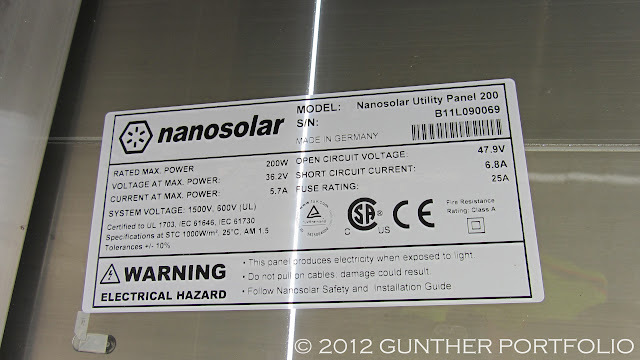 From the serial numbers, the Utility Panels appear to have been assembled last year in Luckenwalde, Germany, I’d guess in 4Q11 (fourth quarter of 2011). While this was what Nanosolar planned per the DoD presentation, I was wondering if these might be upgraded to 11.5% efficient modules. Therefore, the total installed project cost is about $3 Million. Earlier this year, the “Solar Energy Development on Department of Defense Installations in the Mojave and Colorado Deserts” study by the DoD’s Office of Installations and Environment found 7 GigaWatts of solar energy generation potential on four military bases in the California desert alone. Fort Bliss has been designated by the Army as a Pilot Integrated Installation to achieve Net Zero Energy by 2015 to be followed by Net Zero Water and Waste by 2018. This program is the tip of the spear for the Army push to become energy, water, and waste efficient and secure across its infrastructure. Self-sufficiency and conservation are patriotic, practical, and prudent. Does anyone know what percentage of annual power consumption this solar panel installation will replace for Camp Roberts? I’m interested in knowing what the ROI is?